Engineers are essential to an evolving world. We change lives by designing and creating practical solutions to some of society’s most significant challenges. We dream big, and then we work together to turn those ideas into reality. If you want to do work that has a direct and positive impact on the world, pays well, involves creative collaboration with great people, lets you travel and gives you flexibility in your career, you should become an engineer. What is distinctive about studying engineering science at Sweet Briar? 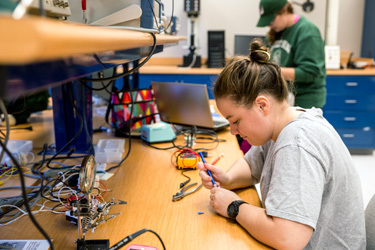 The Sweet Briar College Margaret Jones Wyllie ’45 Engineering Program is an interdisciplinary program that bridges mechanical and electrical engineering. Accredited by the Engineering Accreditation Commission of ABET, our program offers elective courses in environmental engineering, mechanical engineering and electrical engineering. Students thrive in our small, connected engineering community. Faculty make engineering engaging and relevant through a wide range of hands-on engineering projects, starting from our first engineering course and continuing into the senior year. Our curriculum includes Engineering Design in the Community, where students design assistive devices for community partners in Virginia and Brazil. Students and faculty have traveled to Brazil to deliver student-designed assistive devices. We believe that project-based learning and experience in industry or a research lab are critical components of an undergraduate engineering education. Projects are integrated into many of our courses and all engineering students complete an engineering internship. Engineering students have completed internships in a wide range of industries and engineering disciplines. This experience often helps students secure excellent positions after graduation. What can you do with a degree in engineering science? At Sweet Briar College, we are committed to increasing the number of women engineers. 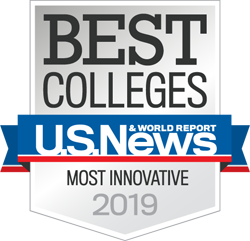 As one of two U.S. women’s colleges with an ABET-accredited engineering program, we prepare women to change the world. One hundred percent of our graduates complete their engineering education in four years, and more than 90 percent work as engineers or study engineering in a graduate program. Our interdisciplinary program prepares students to work effectively in multidisciplinary teams. Our graduates, prepared to approach problems at the systems level, are ready for industry or graduate school. Many have studied in a wide range of graduate engineering programs, including: Dartmouth, University of Virginia, Johns Hopkins and Virginia Tech, to name a few.